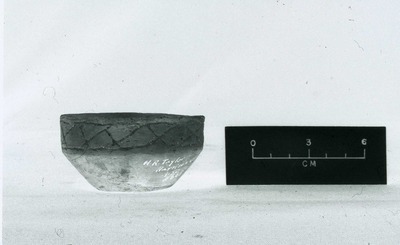 "41HS3, 663, Burial A-50" by Timothy K. Perttula and Robert Z. Selden Jr.
DECORATION (INCLUDING MOTIF AND ELEMENTS WHEN APPARENT): The rim panel has engraved interlocking open triangles or diamonds repeated 12 times around the vessel. Neither the triangles or diamonds have central inner elements. Ripley Engraved, var. unspecified miniature carinated bowl, No. 663, H. R. Taylor site.